The sun is shining so bright today. You know Mother Nature has one hand on her hip, and using the other hand to point and laugh, right? Because it is cold as crap outside, but from inside you think it might be ok for shorts and flip flops. You put said items on to go to the store and people look at you funny. I mean if you DID it, they would look at you funny. WHAT? Ok, so yea, I DID. They are all dressed up like Eskimos. Pfftttt. Anyway, I FINALLY got this recipe. I know you can find these recipes anywhere, but the right amount of this and that, is an art, and my friend Leng is on it. She made these for us so long ago, back when we were friends in Jersey! She and her husband and family live back in Vegas, we are back in Nebraska, so I knew my only immediate chance of getting them again was a Facebook email and making them myself! Thankfully Facebook had taken its meds that day and the email was delivered. When I saw how easy this was I couldn't believe it. Easy AND awesome. You know how we feel in our family about Chinese food. I mean seriously, we should just change our last name to like, hmm, I wonder what the Asian version of "Smith" is. Seriously when I just said that the first name that came to mind was "Long Duck Dong". A complete 80's teen. Did anyone else want to BE Molly Ringwald? Anyone else want to marry JAKE RYAN? Sorry, off topic. Anyway, so do you call these crab cheese wontons or crab rangoon. I always called them crab cheese wontons when they were from a real Chinese restaurant and crab rangoon when they were mall Chinese. What do you call them? 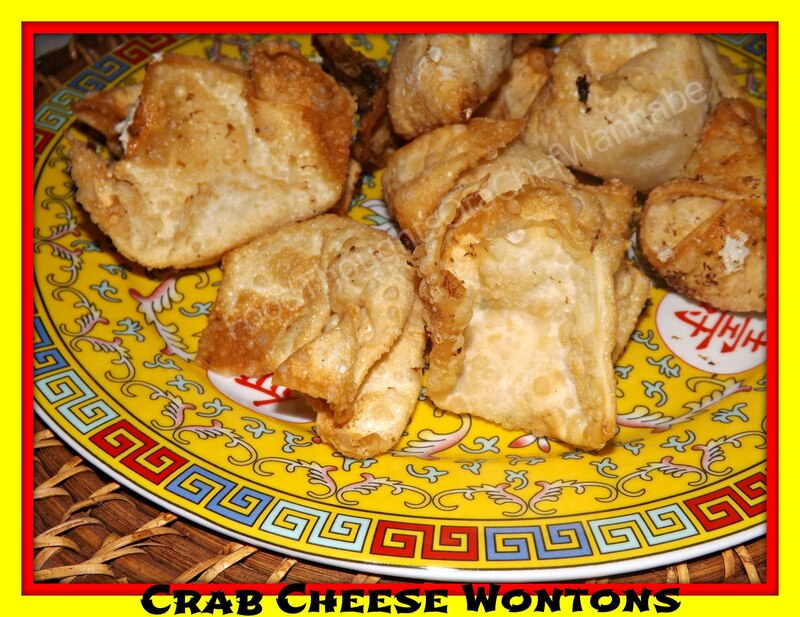 Here is Leng's recipe for, Crab Cheese Wontons,. Thanks so much for letting me share Leng!! I did add an extra ingredient on accident, grabbed the wrong bottle but loved it so gonna through it in! Combine softened cream cheese, worchestire, soy sauce, garlic powder, green onion and hot sauce. Fill your wontons with 1/2 tsp of the mixture in the center and fold however, you like them folded. Just make sure to run water around all the edges so it seals well and no cheese leaks out. Prepare all wontons before frying!! Now prepare your oil I use peanut oil. Put 3-4 inches in a heavy medium sauce pan. Heat oil to 350 degrees. Make sure to fry only a few at a time so you don't overcrowd. This should make between 22-28 wontons. (I think, LOL) I did double fry a few of mine just see the difference. I fried them, let them cool, and then fried a second time. Was ok but not worth the time. Drain on paper towels, or newspapers! Sprinkle with salt when they come out if you wish!! I would do it though! I mean I DID do it. You know what I mean. Use your favorite dipping sauce OR, don't use any at all! Word to the wise, only make as many as you will need or eat, they aren't as good reheated! I guess you could REfry them, but.....you get what I am saying! PS. 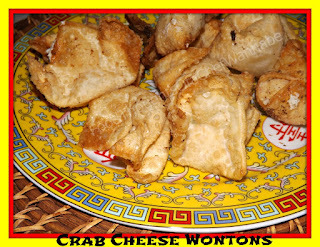 If you don't groove on CRAB cheese wontons, try my regular FRIED WONTONS!